For us teachers, summer may feel like it’s coming to an end, but we still have over a month left of warm, shunshiney goodness! This post is long overdue, but better late then never! For my honeymoon to Greece, I decided to update my swimwear wardrobe with a few new pieces. Swimwear is a staple of summer, and I always find myself adding a few to my collection each year because I love to be on trend! For those who don’t frequent the pool or beach too often in the summer months, this may seem like a waste of money, but it doesn’t have to be when you are frugally minded. Personally, I don’t like to spend more than $20 on a swimsuit, mostly because I update them so often and only wear them a handful of times each year. So this post is all about my favorite places to shop for on trend, bargain swimwear. Wearing one of my new Forever 21 one-piece swimsuits on our honeymoon in Santorini, Greece. My two favorite places to shop for swimwear are Forever 21 & online shops like SheIn or Romwe. Now I know you might be skeptical after hearing this, but let me explain! Below you’ll find a brief review of both and my handpicked favorite swimsuits that won’t leave your wallet crying. Take one glance at these online shops and you’ll probably be overcome with skepticism. Not only do their super low prices seem too good to be true, but their website is not the most user friendly. I have bought numerous swimsuits from both of these websites, thanks to their enticing Instagram advertisements. Hehe. My first purchase was a one piece about three years ago. For less than $15, I thought there was nothing to lose! I was pleasantly surprised. The quality was amazing. The fabric is super thick, and it fit like a glove. I still wear it to this day! Since then I have purchased over 5 swimsuits from these retailers and have yet to have a bad experience. Last year, one did come a little smaller than expected. I just sent in an inquiry for a refund and they refunded the whole amount and let me keep it! For our honeymoon, I bought a black one-shoulder one piece with a cutout. The fit was great and gave me great coverage over my bum, something I always look for. :) AND it was less than $10! 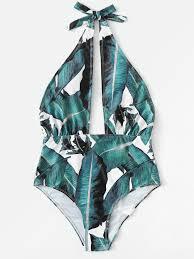 So if your looking to make some swimwear purchases for an upcoming trip, or in need of a trendy update, I hope you consider one of these budget-friendly options. For an item in your wardrobe that is honestly seldomly worn, there’s no need to overly invest! Penny pinch where necessary so you can make better investments where needed!